Works of art owned by the British royal family are back on Dutch soil in an exhibition, At Home in Holland, at the Mauritshuis, The Hague. The paintings now on loan from queen Elizabeth II were originally collected by her predecessors during a surge of enthusiasm for the Dutch artists of the Golden Age. Most of the 22 paintings on display today were bought by George IV during the early 19th century. This royal collection is considered one of the most important collections of Dutch art anywhere in the world and reflects the huge influence the artists from the Netherlands had on the English art world. The first purveyor of the English monarch’s artworks in 1625 was Dutch. The genre movement focuses on ordinary Dutch people’s everyday lives and leaves a unique insight into the social history of the Golden Age. The first link between this art and the British royal family came when Gerrit Dou’s The Young Mother was given to Charles II. The Dutch republic gave him the ‘Dutch gift’ when he left Holland to become king of England in 1660. Charles was so impressed that he asked Dou to become his court artist, but the artist turned him down, saying ‘I would rather live like a prince in Leiden than work for a prince’. Dou was a student of Rembrandt and later founded the Leiden School of Fine Art. His painting stayed in England until William III inherited the royal collection and sent the picture back to decorate the Het Loo palace, at Apeldoorn. It remained in the Netherlands, despite queen Anne asking for it back, and is now owned by the Mauritshuis. The genre stage of Dutch art brought in a highly detailed record of daily life for the lower classes of society. Artists concentrated on the setting of their paintings, people’s clothing, objects surrounding them, the expressions on their faces, the interaction between them and, in some cases, inserting hidden messages. Paintings by Adriaen van Ostade vividly portray interaction between men and women. An Elderly Couple in an Arbour shows a frequent theme in Dutch art – a man attempting to persuade a woman to drink. Other everyday social interaction is shown by Pieter de Hooch with his Card Players in a sunlit Room and A Courtyard in Delft which chronicles women at their work of spinning and collecting milk. The stand-out painting in the collection is Delft-born Johannes Vermeer’s The Music Lesson, which was initially wrongly attributed to Frans van Mieris the Elder until 1866 when it was recognised as a Vermeer masterpiece. The Venetian collector Giovanni Antonio Pellegrini had purchased the picture in 1718 and it was eventually bought by George III, who had principally wanted the 50 Canaletto paintings alongside it and dismissively referred to it as a ‘little nothing’. Now it is hailed for its perspective and the way in which it draws in the viewer’s eyes to the back of the interior to look at the two figures around the instrument. 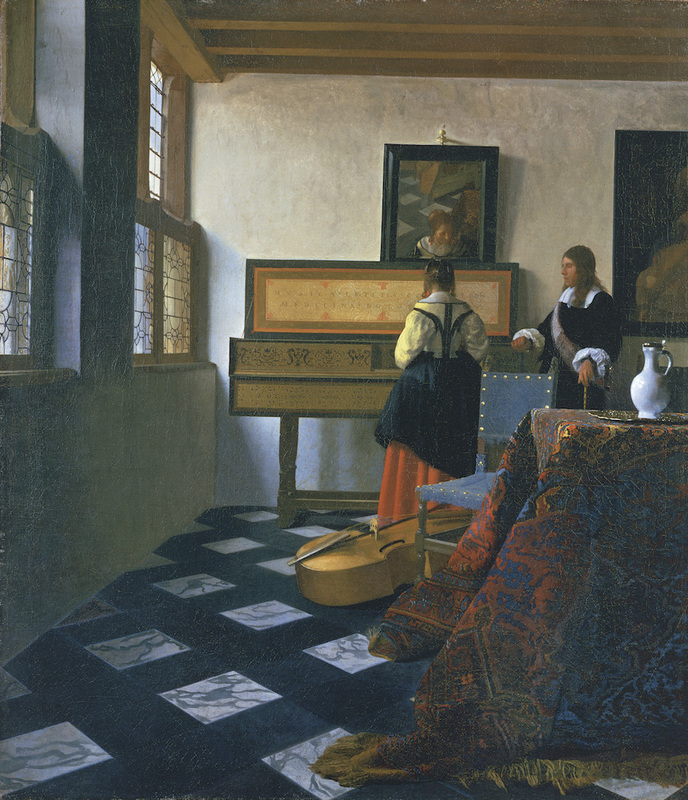 The mirror above the woman’s head reflects the legs of Vermeer’s easel and the inscription on the instrument translates into ‘Music is the balm of sadness and the companion of joy’. The scene in A Twelfth Night Feast: The King drinks shows the boy who has been chosen as king for the evening while another character has an exquisitely detailed wicker basket on his head, which signifies gluttony. Some of his paintings include an owl, a symbol of folly, which gives a ‘gentle condemnation’, says Choy. 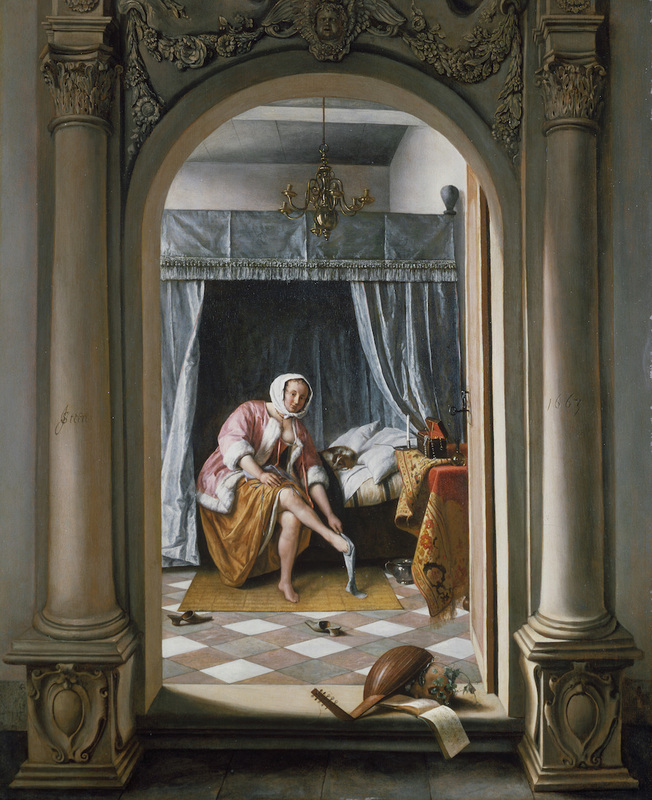 Another highlight of the exhibition is Steen’s A Woman at Her Toilet. She is gazing seductively at the viewer and pulling off her stocking – or putting it back on after a tryst – suggesting a woman of ill-repute. At Home in Holland: Vermeer and his contemporaries from the British Royal Collection, runs until 8 January 2017.